Questions about underperforming daffodils abounded in the last week. Most of those queries began, "Why aren't my daffodils blooming this year?" Unlike the bulb itself, this question is a long-lasting perennial, guaranteed to pop up in late February and early March. Many times, daffodils won't flower if they were cut down prematurely the previous spring. Always wait until the leaves turn completely yellow before removing the leaves. This is about six weeks after flowering. If it doesn't rain, make sure those daffodils still get irrigation until the leaves are yellow. The good news: you can leave those daffodils in the ground year round. 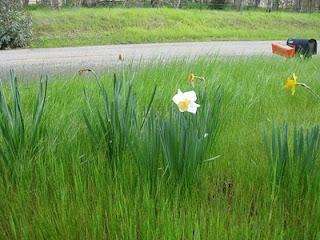 Those non-performing daffodils may be just too darn crowded and are not getting enough food and water. If it is part of a large clump of daffodils that have ceased to bloom, it's time to separate them. When the foliage turns brown, dig and separate the bulbs. Replant them immediately, six inches apart and about six inches deep. Or, you can dry the bulbs in the shade, store them in mesh bags, and replant the bulbs in the Fall. • Bulbs have not been fed in a couple of years. Broadcast a 5-10-10 fertilizer when leaves emerge, and again at bloom is a reasonable feeding schedule. (I prefer to feed blooming annuals, perennials and bulbs with a lower dosage organic fertilizer, such as this 3-7-4 formulation). • Feeding has been with a high-nitrogen fertilizer. This encourages production of leaves, but seems to quell the plant's need for flowers. • Bulbs are planted in a shady area. Daffodils need a half-day of sun at least to produce flowers. • Bulbs are in competition for food with other plants. Planting under evergreen trees or with other fast-growing plants limits the food they can get. Result: weak plants and no flowers. 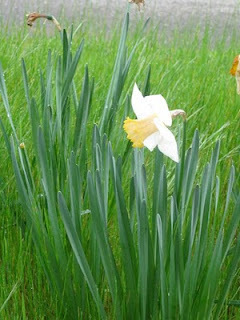 • Daffodils love water but must have good drainage. They do not do well where the water puddles, increasing their susceptibility to basal rot fungus. A stem cross-section that looks like this picture may be basal rot. A healthy stem is white. Basal rot is incurable; dig and discard the bulbs. 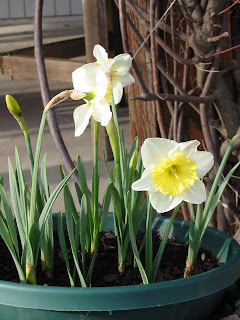 • Bulbs may be stressed from transplanting. Some varieties seem to skip a year of blooming if dug and replanted in a different environment. • Some varieties bought from a grower in one climate may have a difficult period of adjustment to a vastly different climate. They may bloom the first year off the previous year's bulb, but then be unable to adequately build a flower for the following year. • The bulbs may have a virus. Over time, an infected plant loses its vigor, puts up smaller, weakened leaves and stems, stops blooming, and finally dies. Dig and throw away the bulbs. • Growing conditions the previous spring may have been inhospitable and the reformation of the bulb was affected. An early heat wave may have shut down bulb rebuilding before it was complete. The bulbs may have be grown in a smallish pot without adequate feeding or protection from heat and cold. • Never buy or plant a "soft" bulb. Retail bulbs typically remain in closed crates for a lengthy period of time during shipping. These humid conditions are near-perfect for the proliferation of fungus diseases such as basal rot or fusarium.